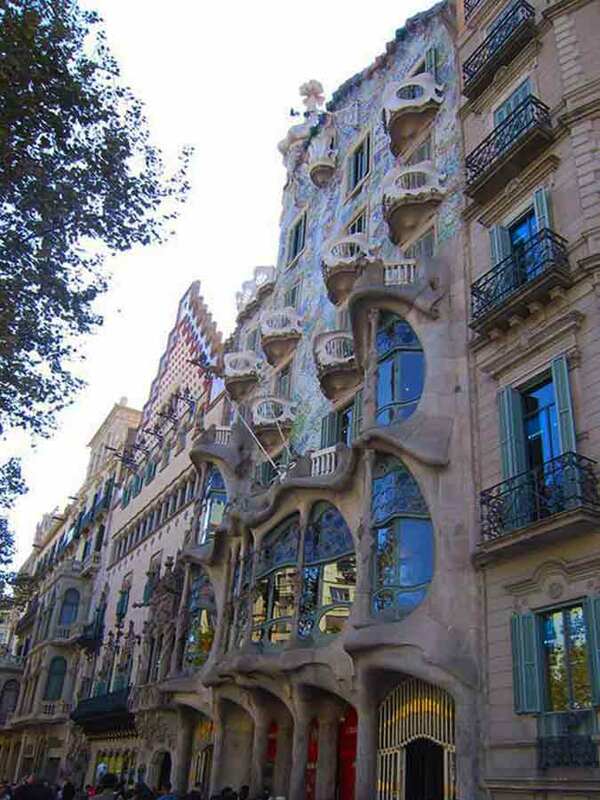 The building was built 1875-77 in Barcelona, had a basement, a ground floor, four other floors and a garden in the back. 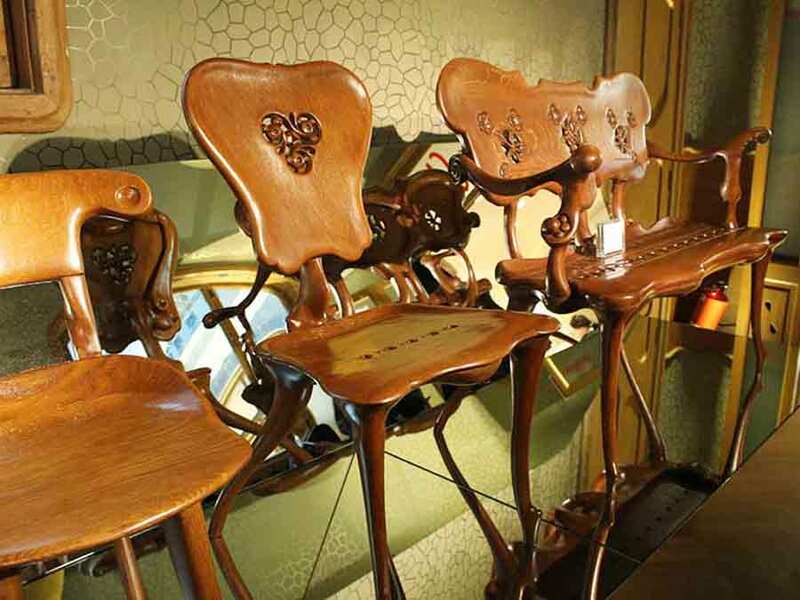 Textile manufacturer Josep Batlló, who was the owner since 1900, initially planned demolition of the house and place at this point a new building in 1904, but eventually decided on a contract to rebuild the building. 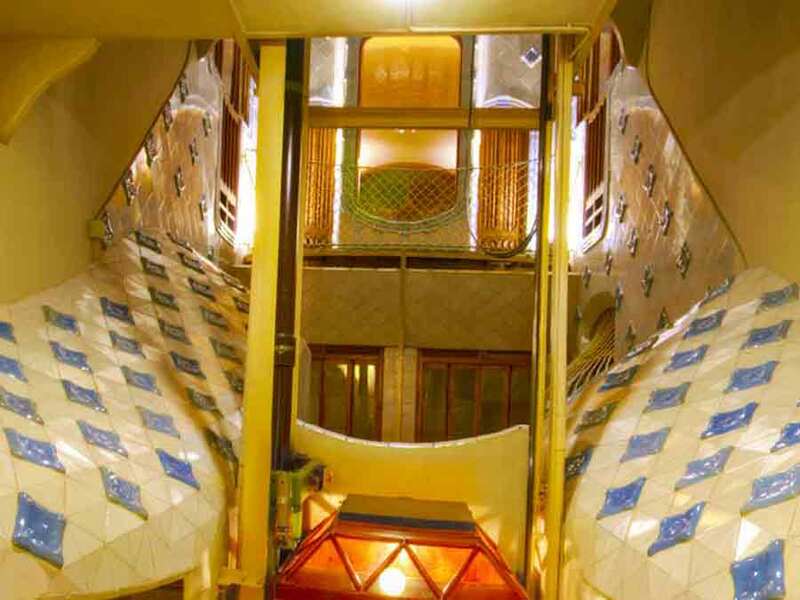 The initial task was to bring down the building and build a new one; however, Batlló convinced Gaudi to keep it and make a transformation reforming only the facade. 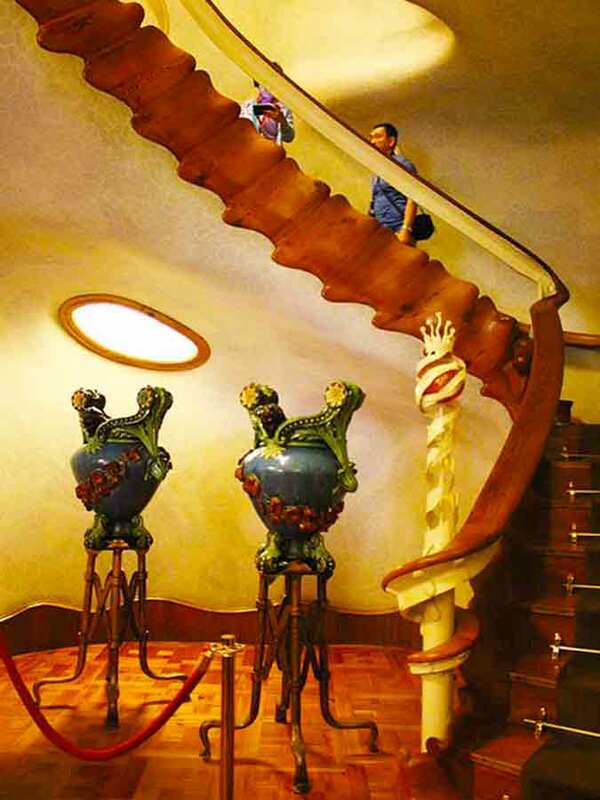 Finally intervention, however, went far beyond as it was a major reorganization of spaces, more natural lighting and ventilation, two-story additions and remodeling the attic and the roof. 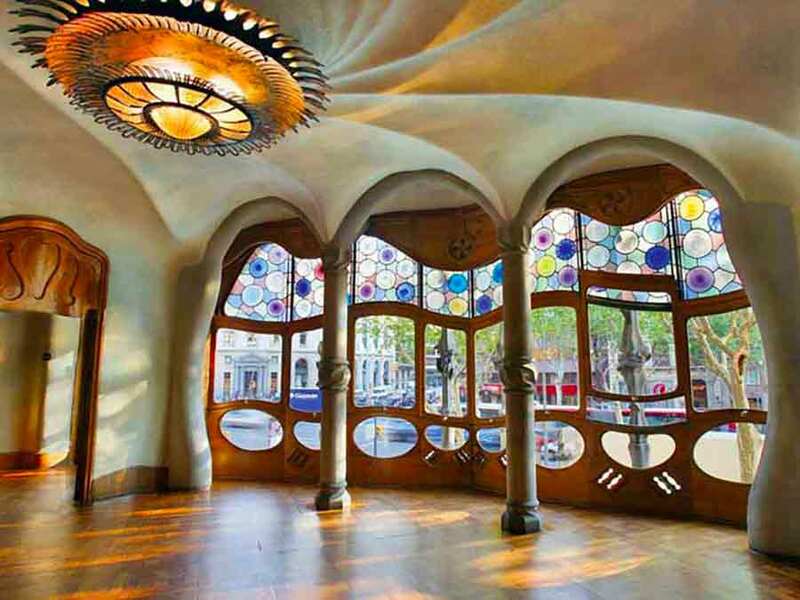 Josep wanted an architect that would design a house that was like no other and stood out as being audacious and creative. 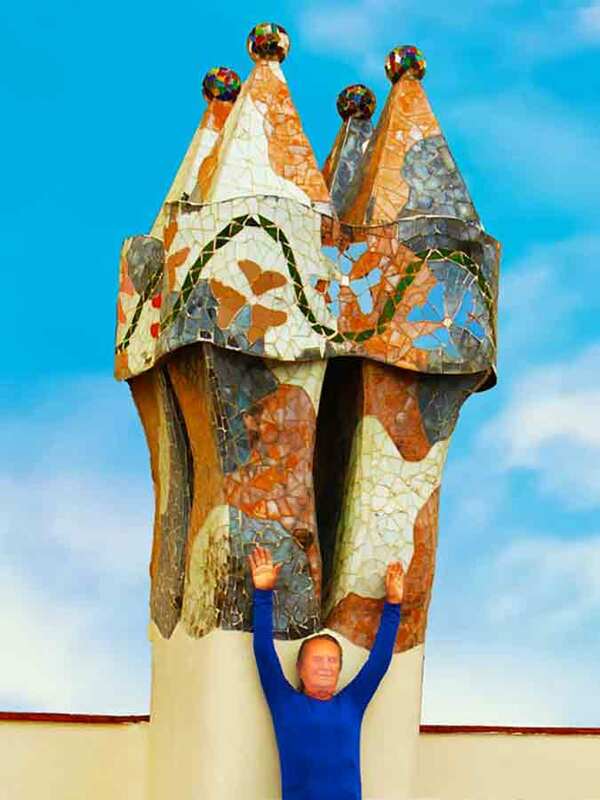 He chose the architect who had designed Park Güell because he wanted him to come up with a risky plan. 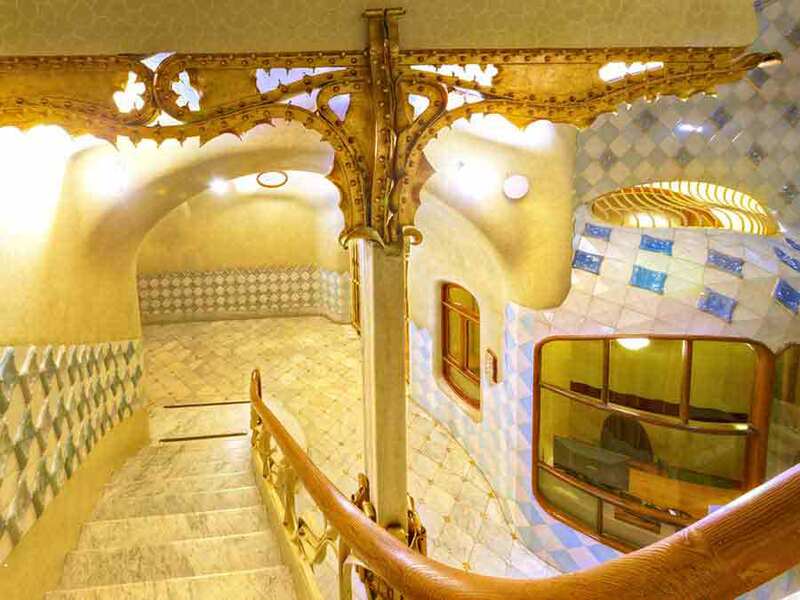 Gaudí personally supervised the work carried out. 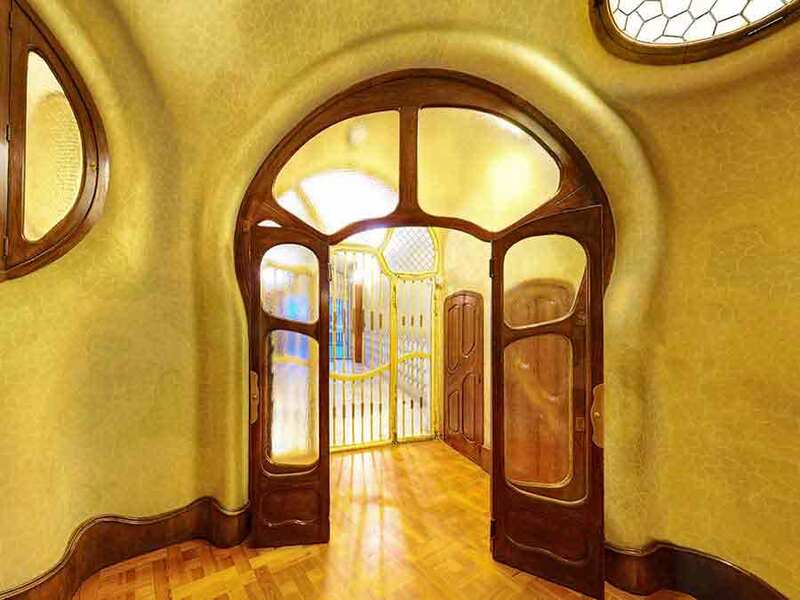 He completely changed the main apartment which became the residence for the Batlló family. 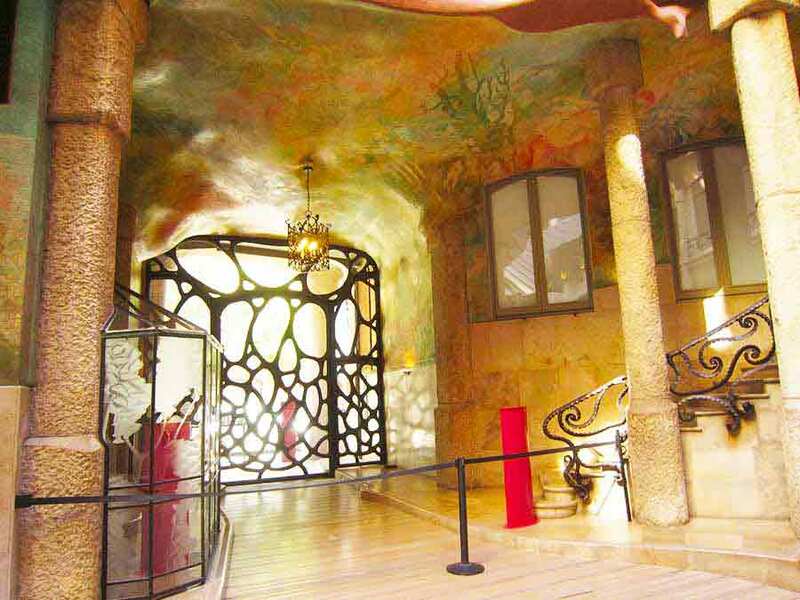 Building was remodeled in the years 1904-06 by Antoni Gaudí and has been refurbished several times after that. 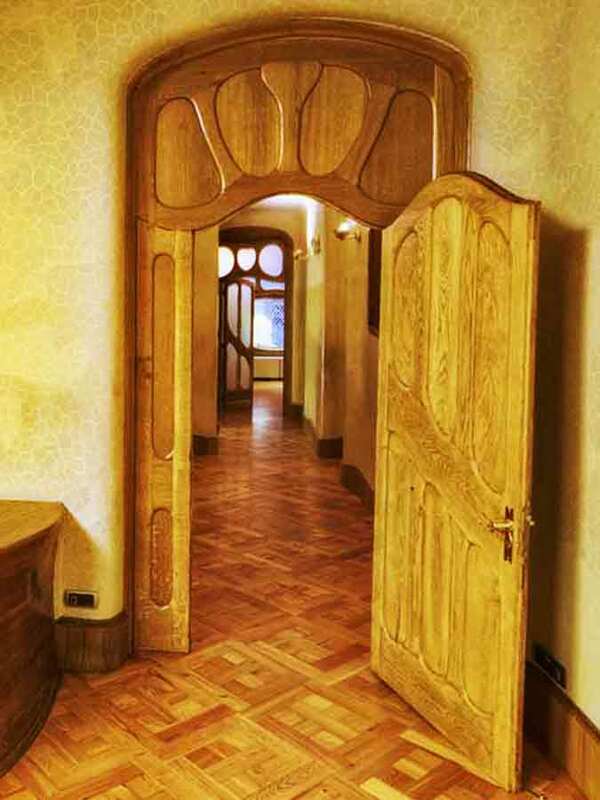 Gaudi also designed the interior design details - furniture, lighting, chandeliers, etc. 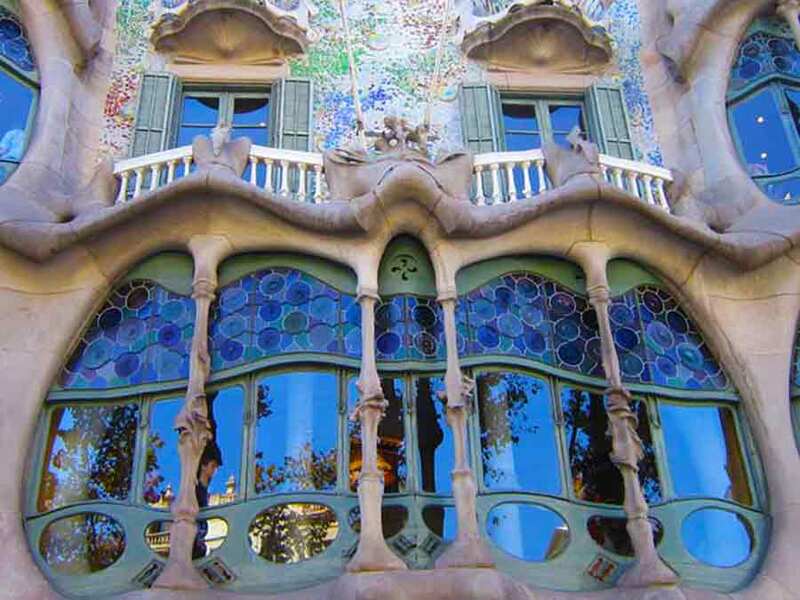 UNESCO added the Casa Batlló to its list of World Heritage sites in 2005. 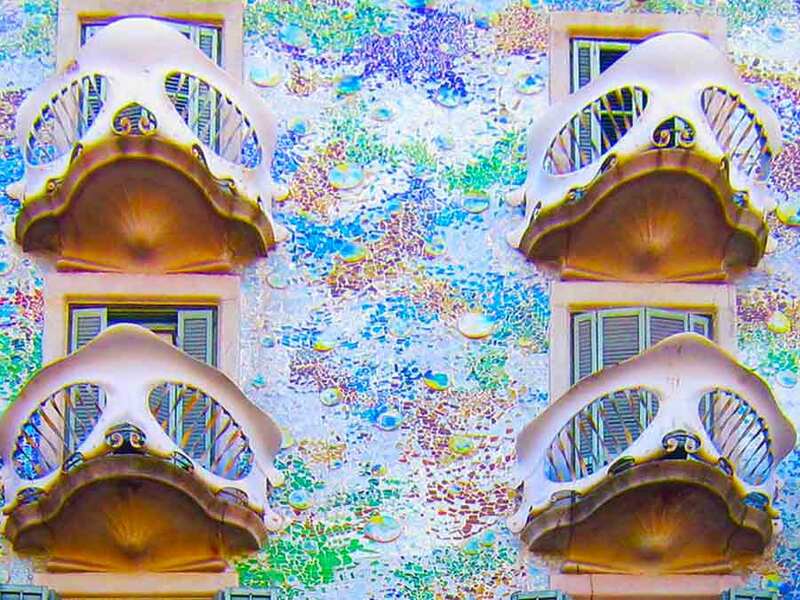 Casa Batlló Facade evokes the surface of a lake with water lilies, with gentle ripples and reflections caused by the glass and ceramic mosaic. 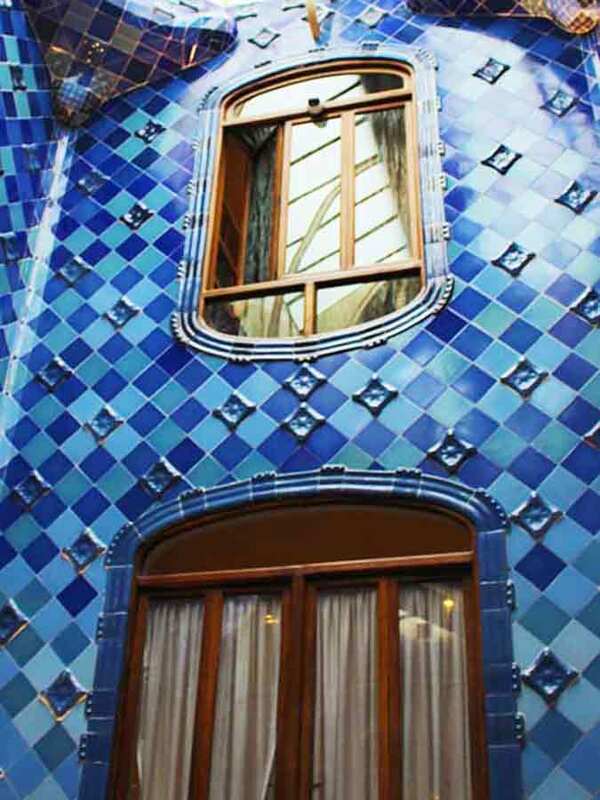 Casa Batlló detail of the roof, with pieces that seem to be an elbow armor. 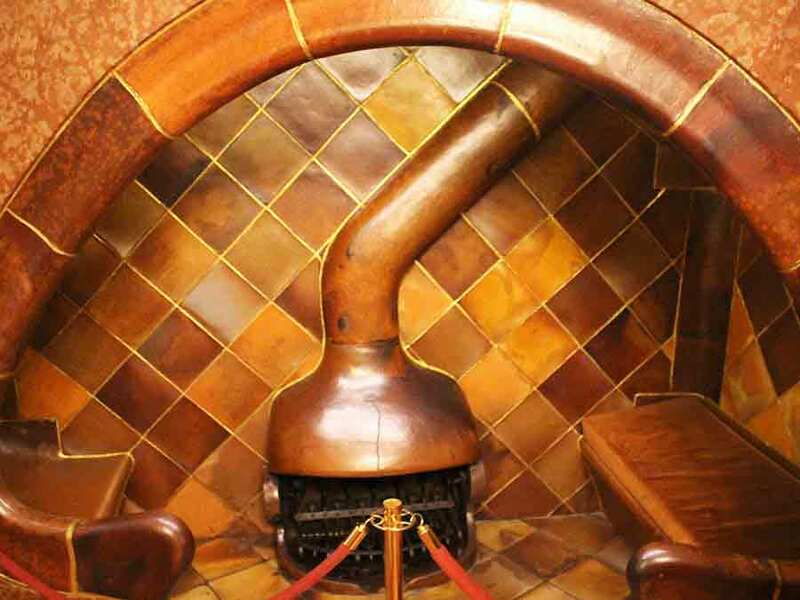 Cross and detail of the roof Casa Batlló - close-up of a chimney. 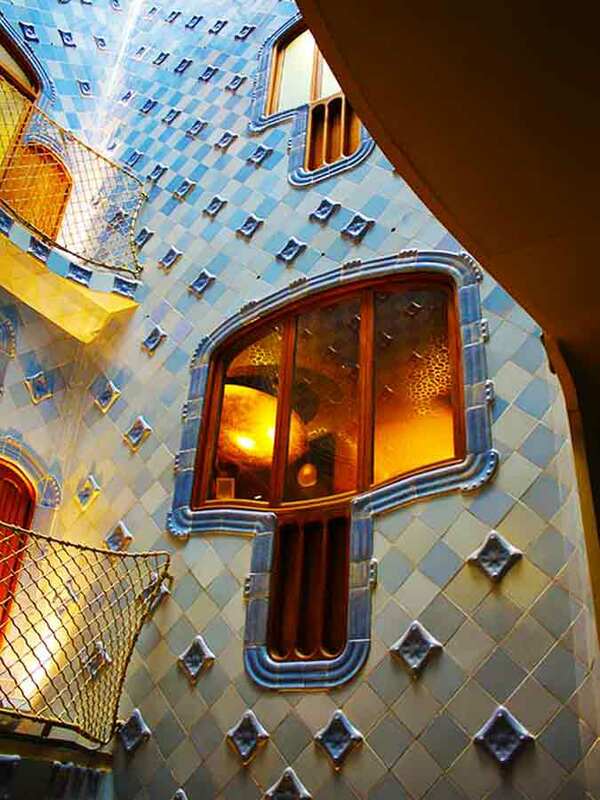 Casa Batlló tower topped with a cross of four arms oriented to the cardinal directions. 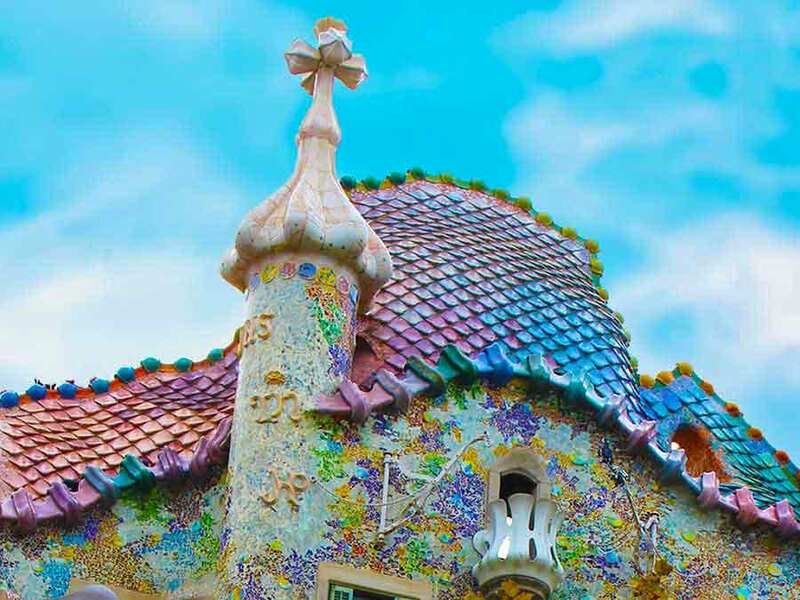 The roof is arched and scaled - it was likened to the back of a dragon, which refers to the legend of Saint George (patron saint of Catalonia, Gaudí's home) and the dragon, which is part of Catalan national identity. The rounded feature to the left of centre, terminating at the top in a turret and cross, represents the lance of Saint George which has been plunged into the back of the dragon. 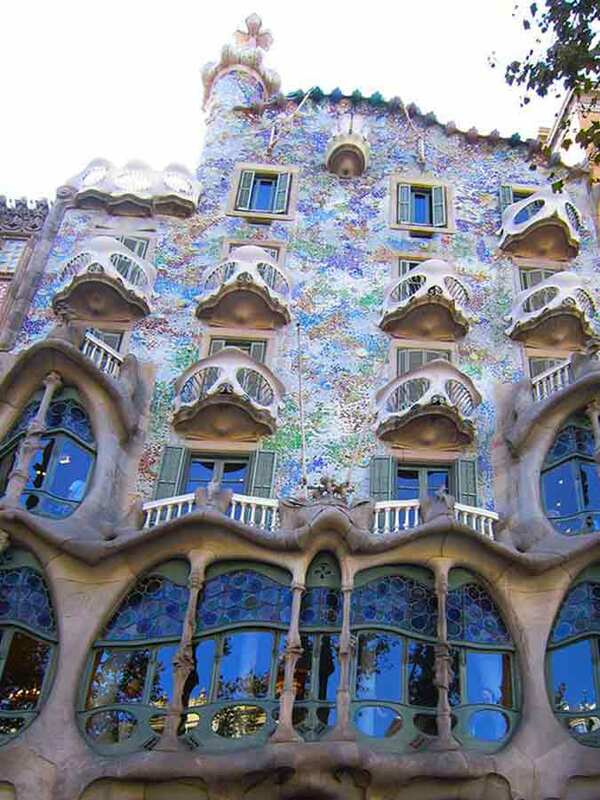 The building is richly decorated, and on its facade consists of a number of elements referring to animal motifs, such as the bones (a form of balconies), scales (roof), fish scales (tiles on the walls). 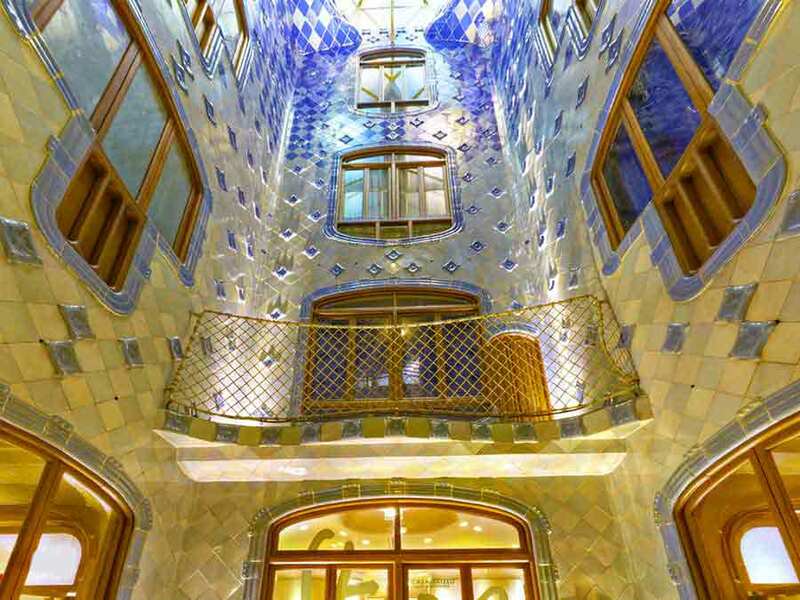 The ground floor, in particular, is rather astonishing with tracery, irregular oval windows and flowing sculpted stone work. 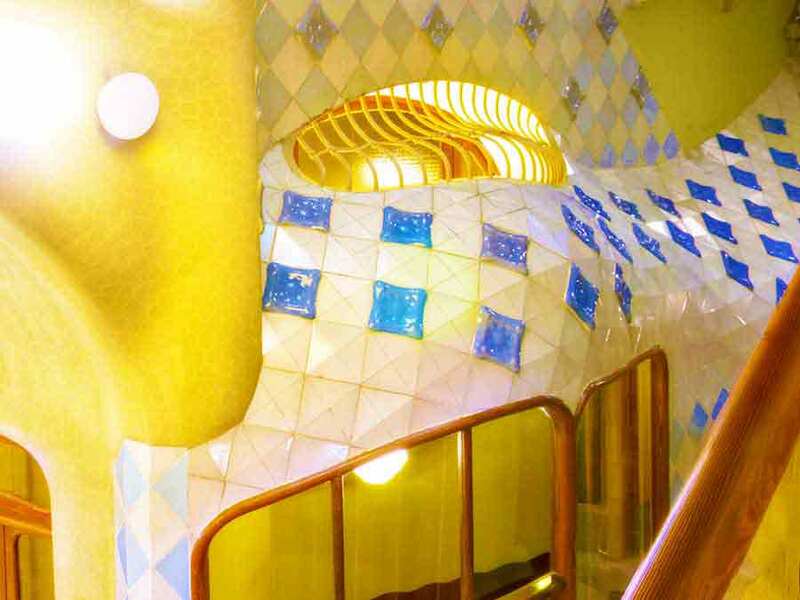 The goal of Gaudi was to avoid straight lines completely. 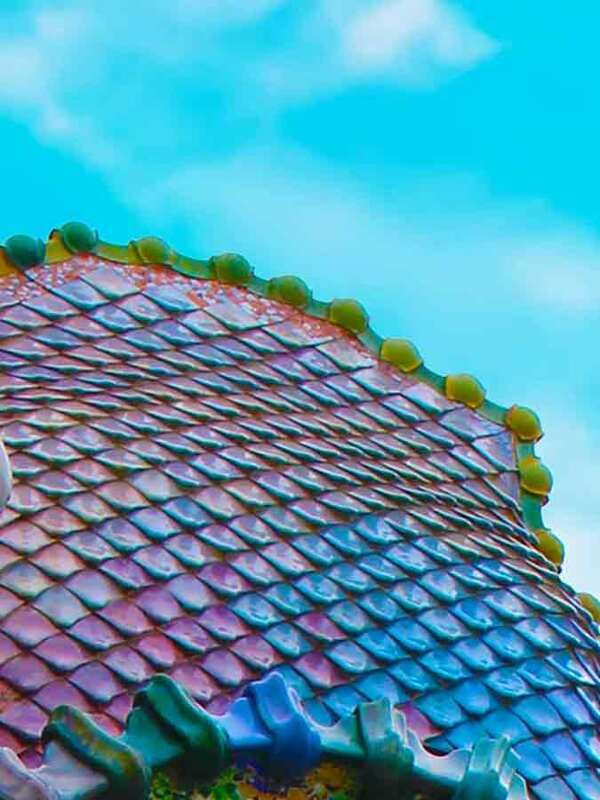 Much of the façade is decorated with a colorful mosaic made of broken pottery and ceramic tiles, that starts in shades of golden orange moving into greenish blues. 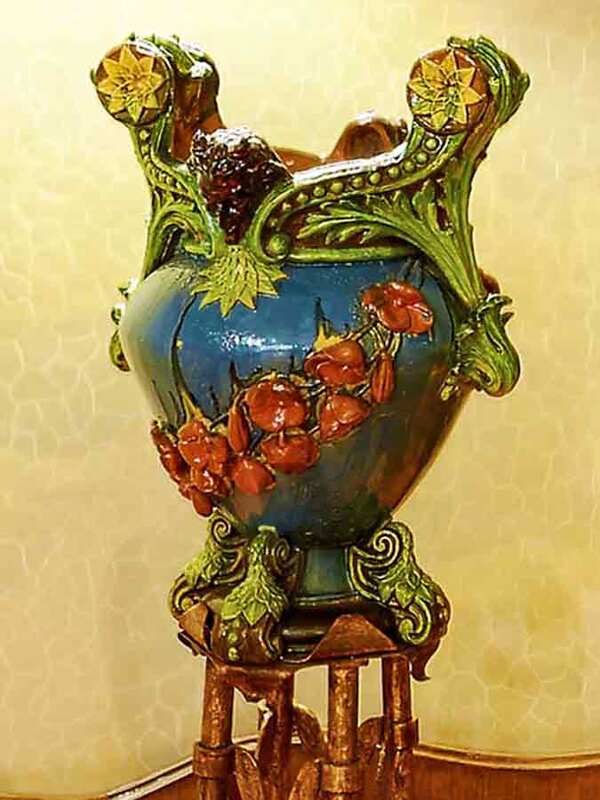 According to Leonardo da Vinci, nature is full of latent causes that have never been released. 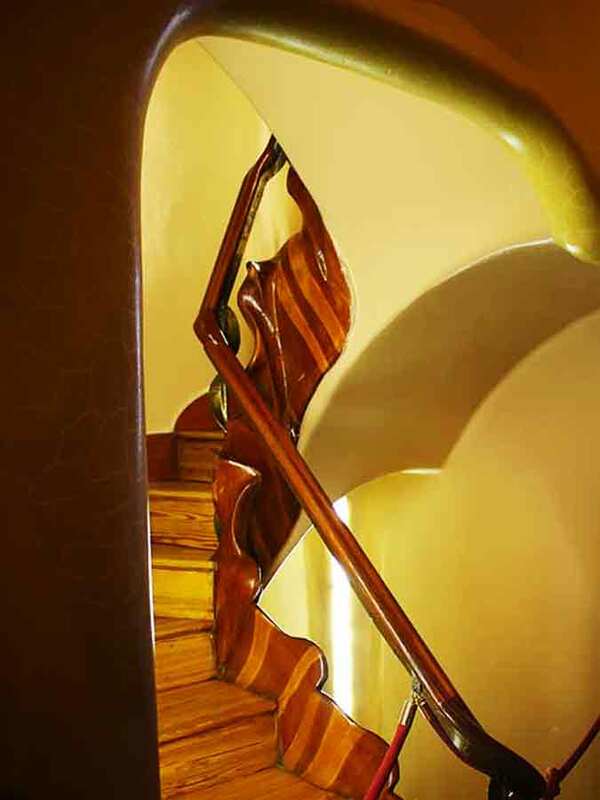 The architecture of the Batlló house is releasing one of these arcane natural grace of imagination and creative power of Gaudí. 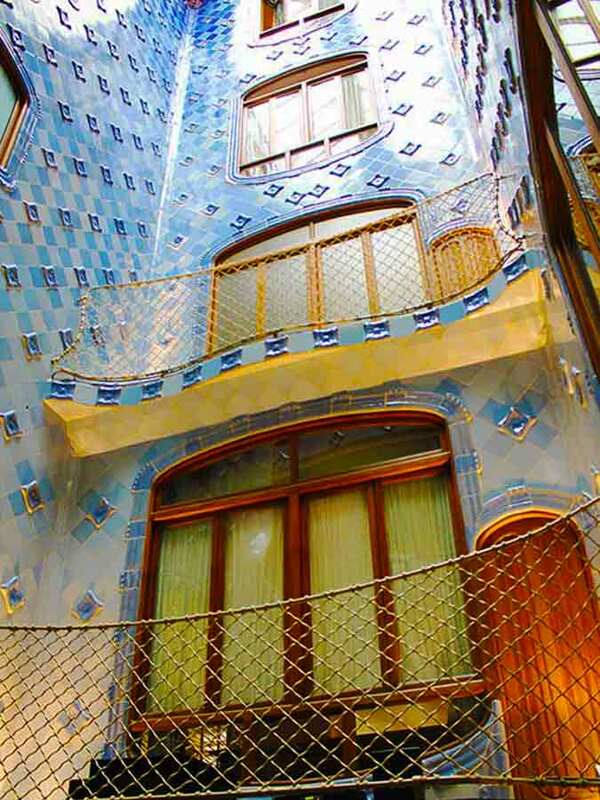 Casa Batlló facade street view. 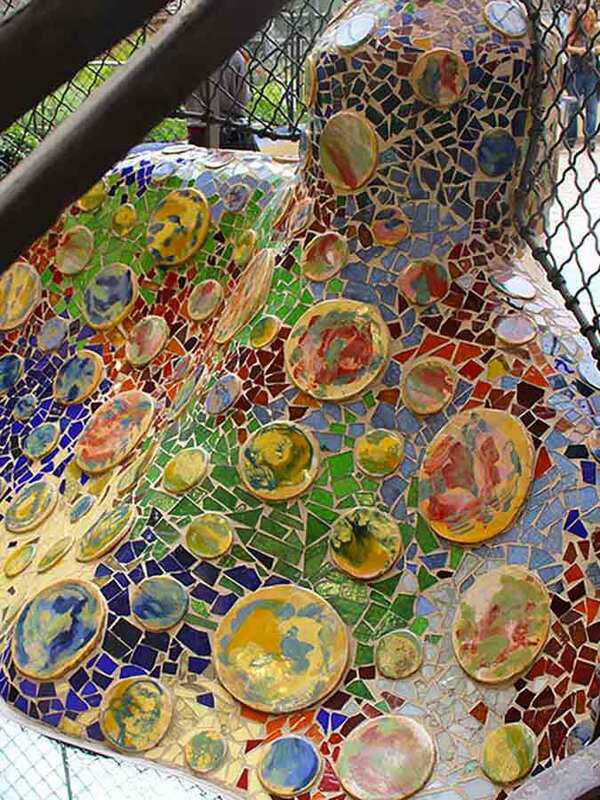 Casa Batlló Façade is decorated with a colorful mosaic made of broken pottery and ceramic tiles. 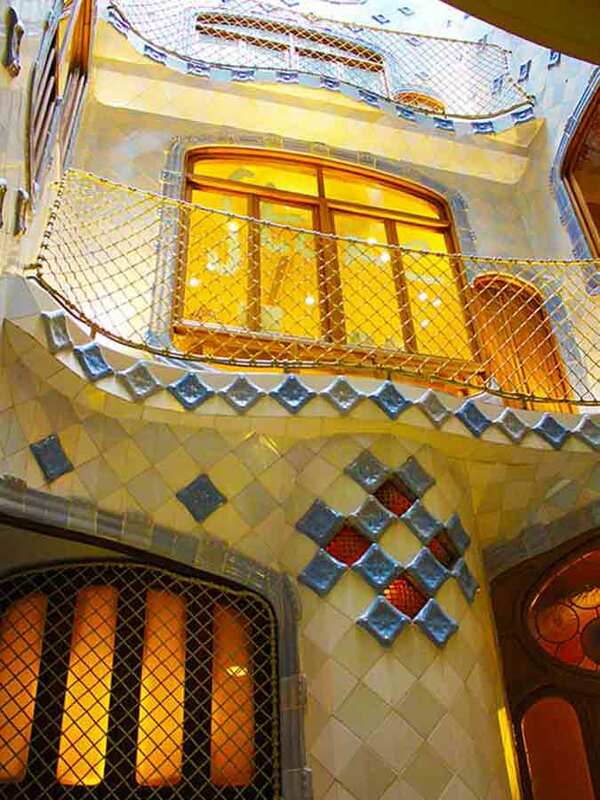 Casa Batlló facade has three distinct sections and three kinds of balcony. 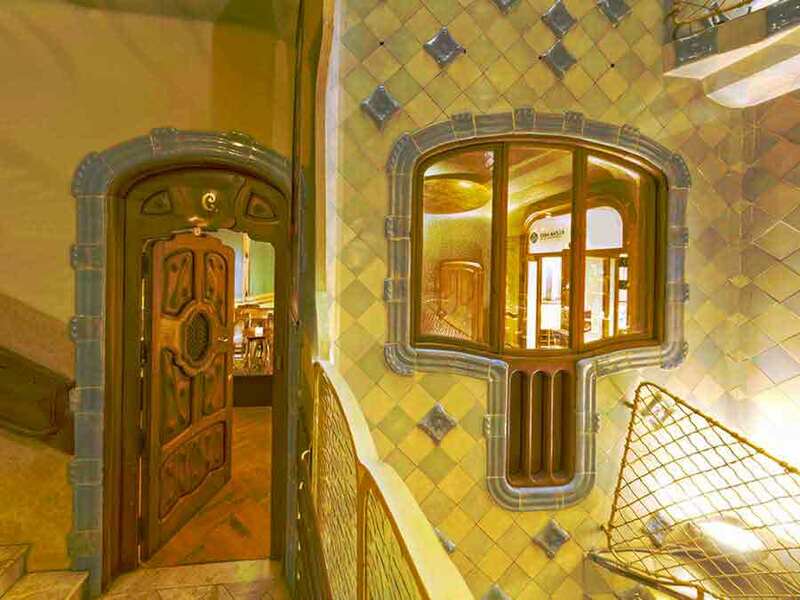 Casa Batlló - Interior of the Noble Floor - relates to a fantasy world. 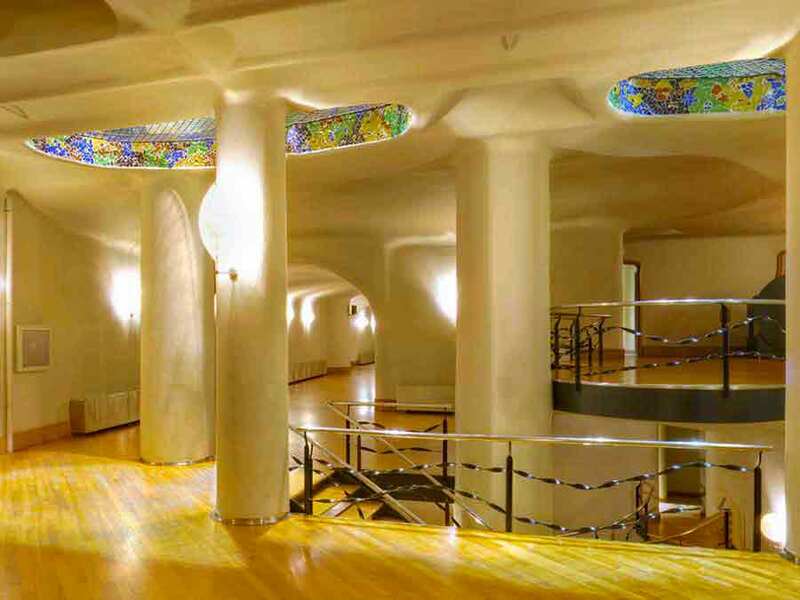 Casa Batlló the loft, previously service area, has sixty parabolic arches. 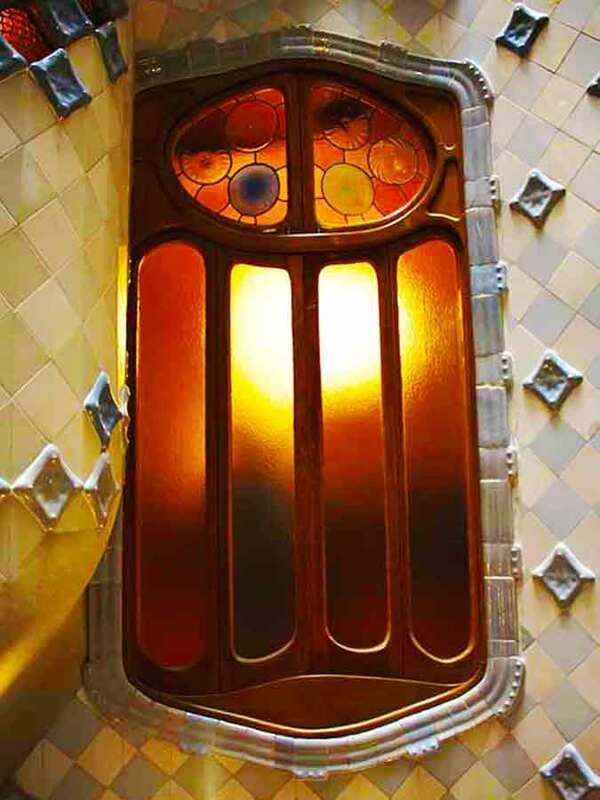 Gaudí conceived the building as nature, as a living organism, where each element is alive and has a function that is dynamic. 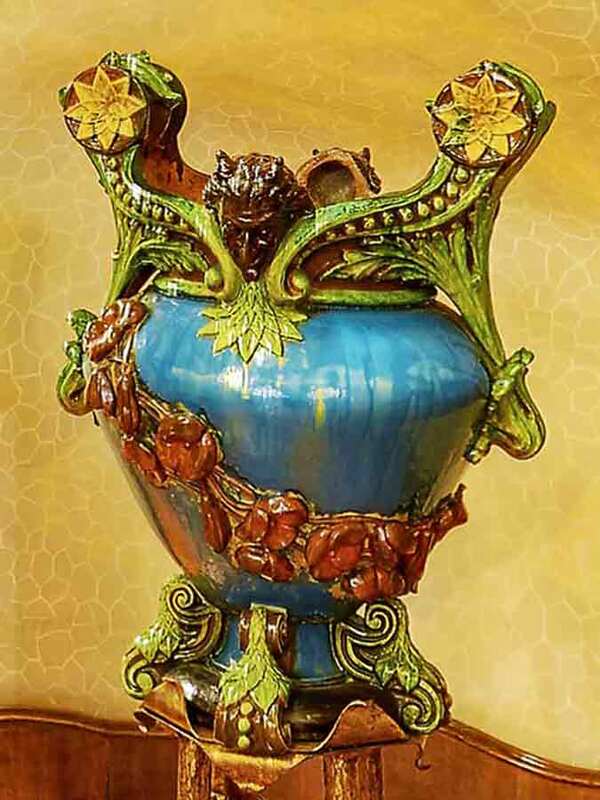 That is, is both sustained and sustaining part of the work and, above all, is a unit. 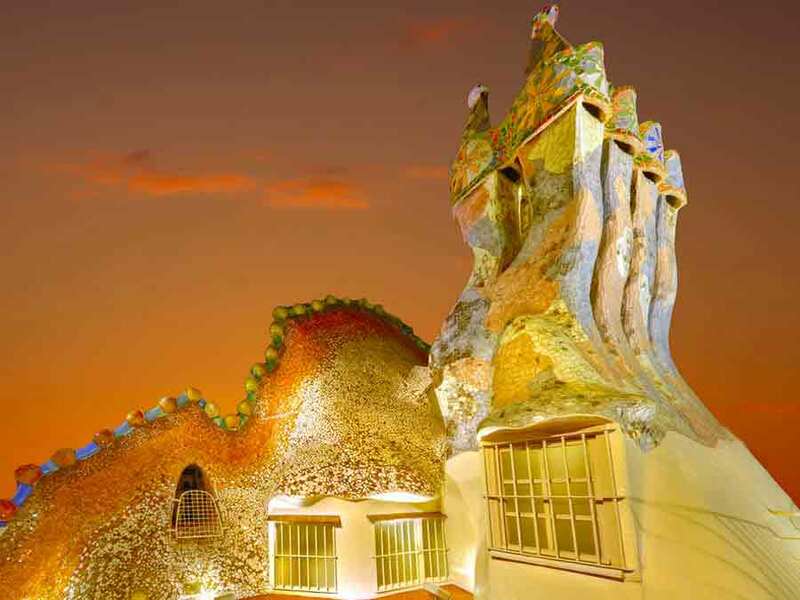 The shapes of Gaudi have triumphed in the design world and are related to the physical deterministic, with the principle of Werner Heisenberg. 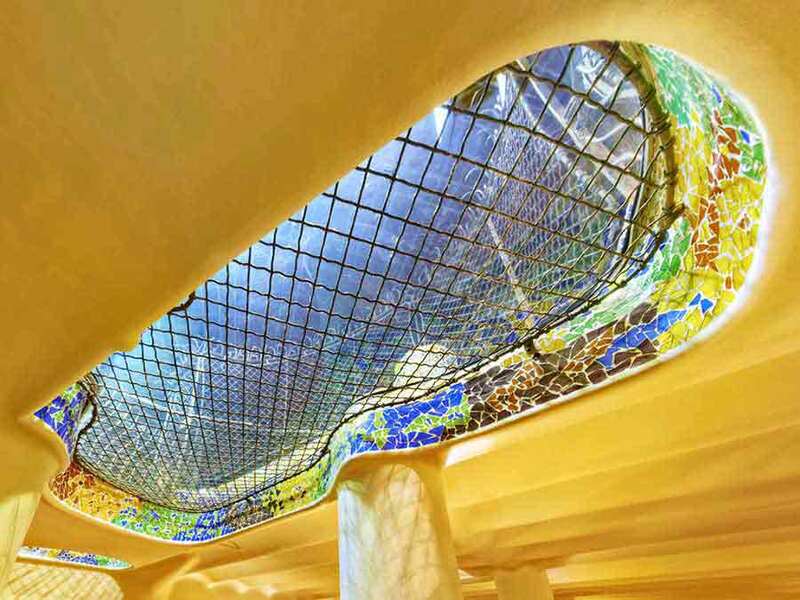 Casa Batlló, Gaudi used large skylights in the base of the rear terrace and patios to illuminate the basement. 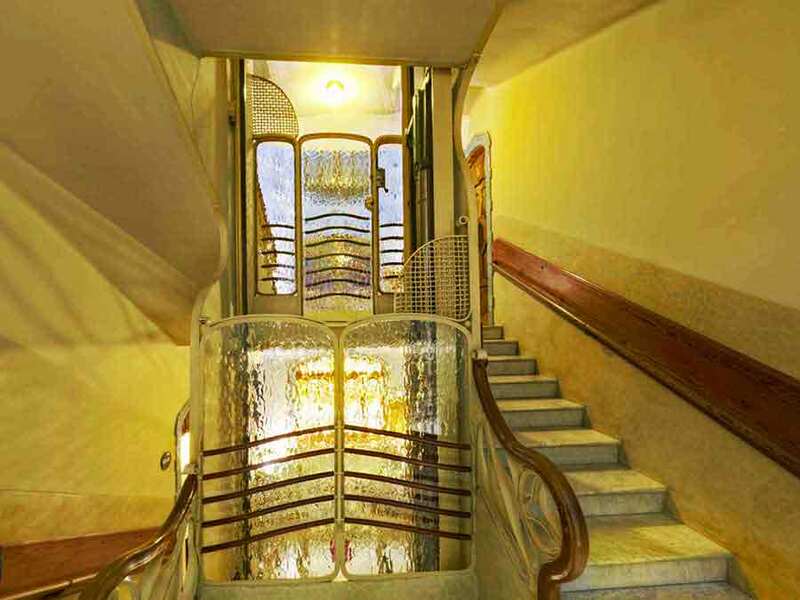 Casa Batlló unique design of the staircase. 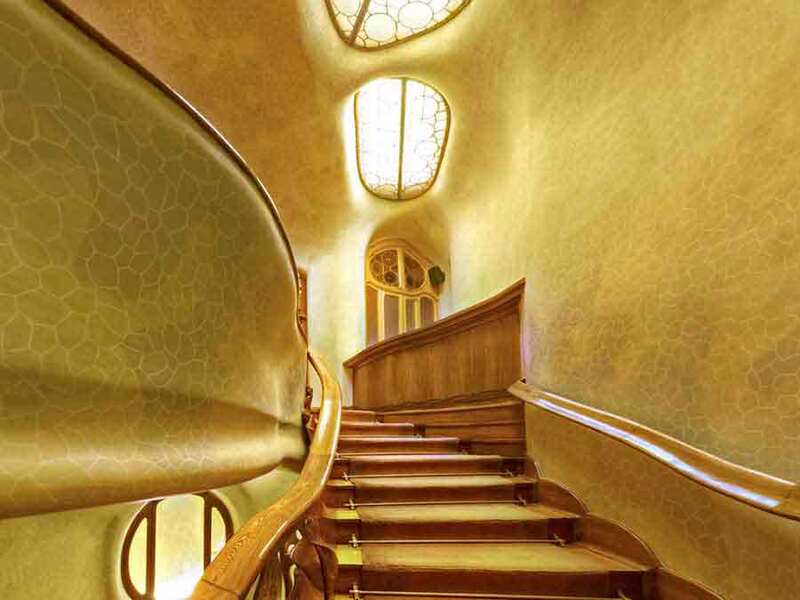 Gaudí never posed no objective rationality of the structure, but, from a constructive predetermined criteria, determined that it is more dramatic vicissitude express the difficulties of construction. With a taste for the complexity of spaces and volumes and a desire to sacrifice space for organic, becoming an interference space that blurs the boundaries of the building. 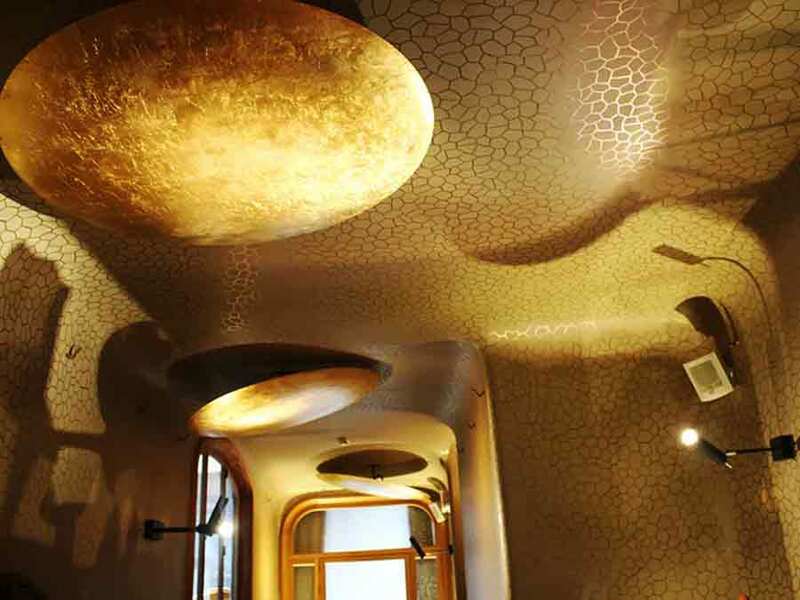 This trend is particularly marked in the Casa Batllo, where galleries and balconies blur the line between interior and exterior. 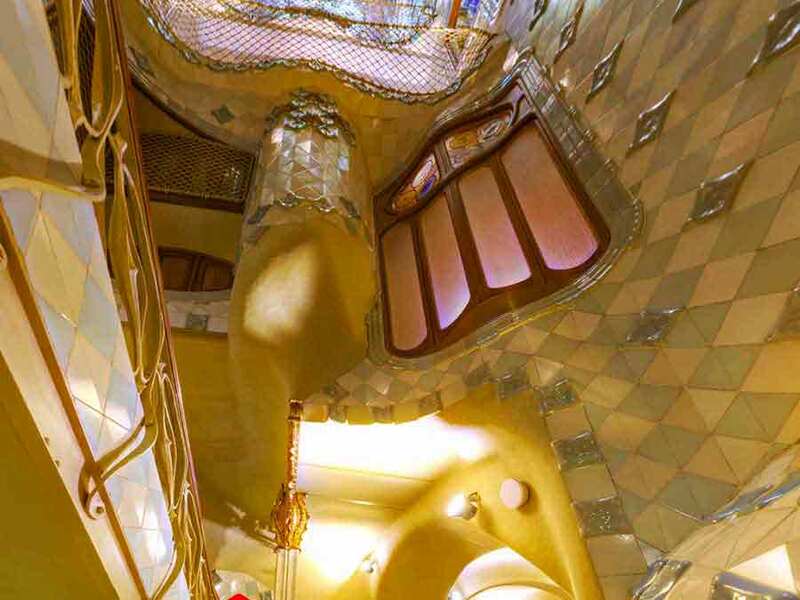 Casa Batlló unique design of the staircase and ceiling. 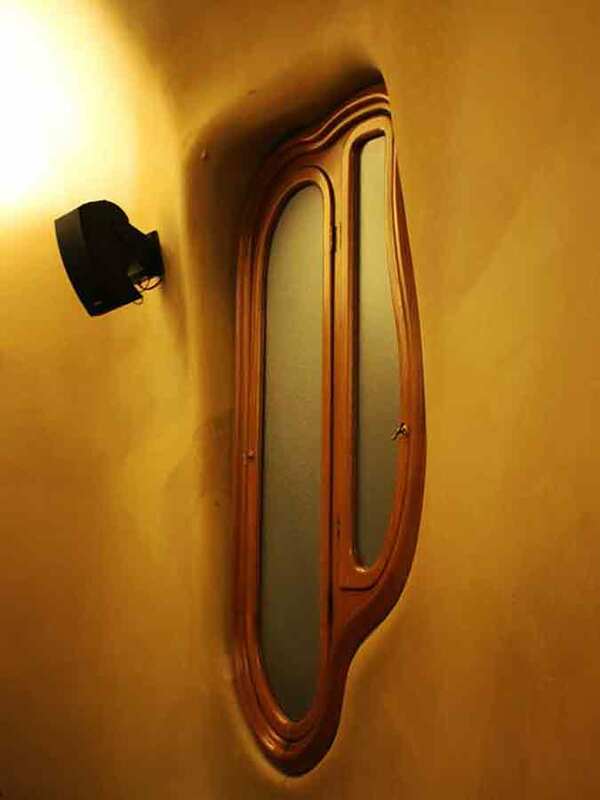 Casa Batlló - window inside the ventilation system. 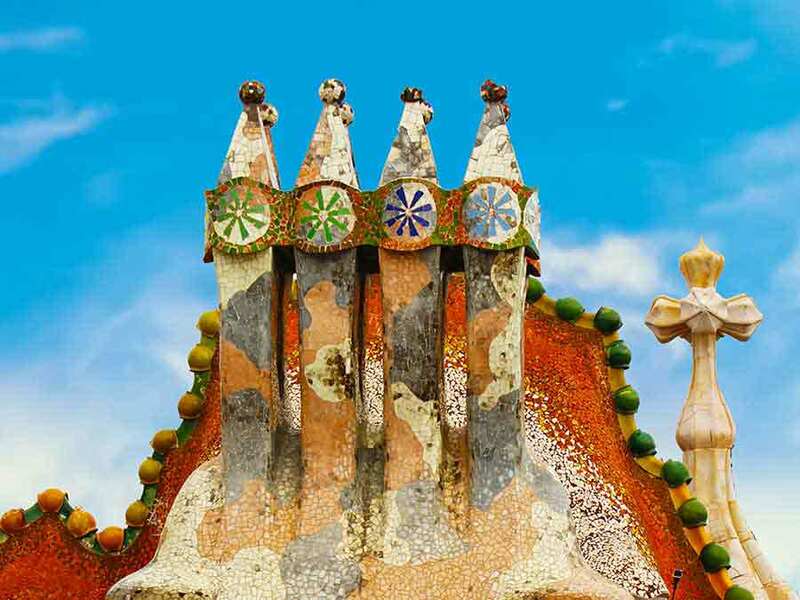 One of the highlights of the facade is a tower topped with a cross of four arms oriented to the cardinal directions. 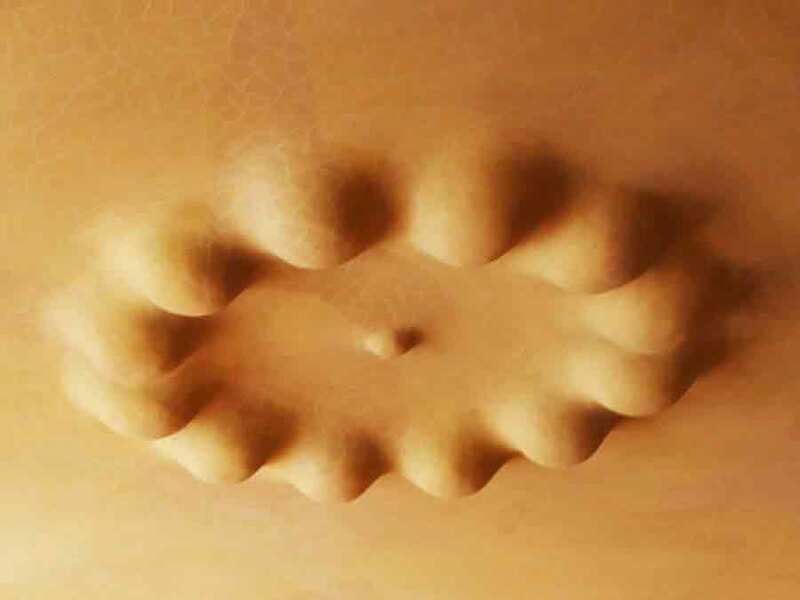 It is a root-like structure that evokes plant life. A second bulb-shaped structure is reminiscent of a thalamus flower, represented by a cross with arms that are actually buds announcing the next flowering. The tower is decorated with monograms of Jesus (JHS), Maria (M) and Joseph (JHP), made of ceramic pieces that stand out golden on the green background. 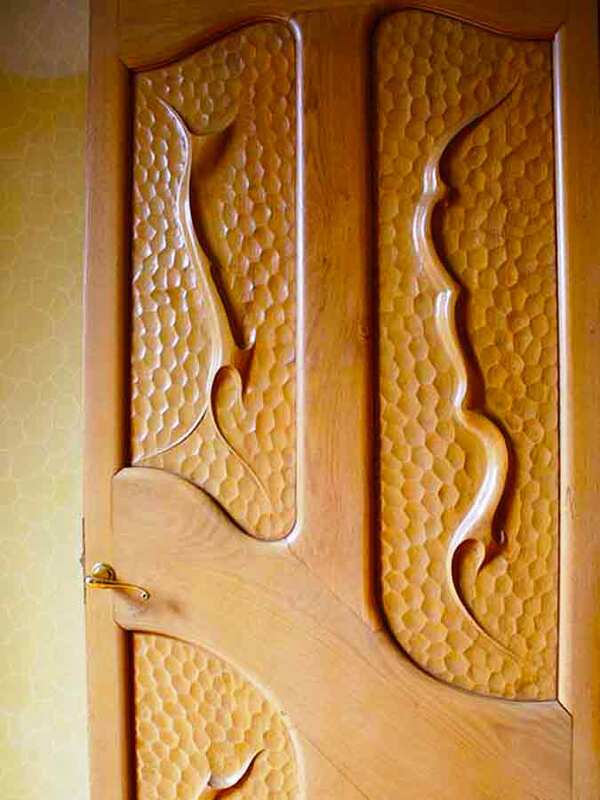 These symbols show the deep religiosity of Gaudi, who was inspired by the contemporaneous construction of his basilica - to choose the theme of the holy family. 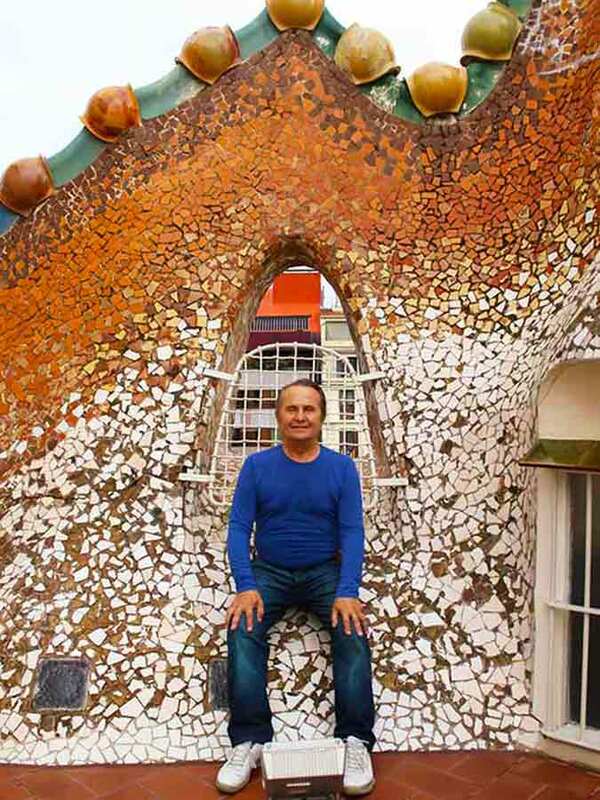 Casa Batlló, Wieslaw Sadurski on the roof. 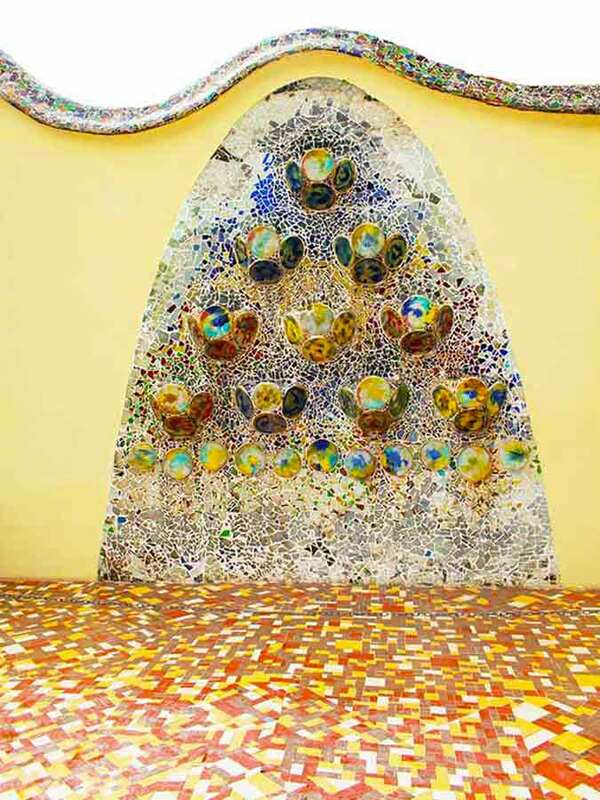 Casa Batlló, Mosaic Wall on the Roof. 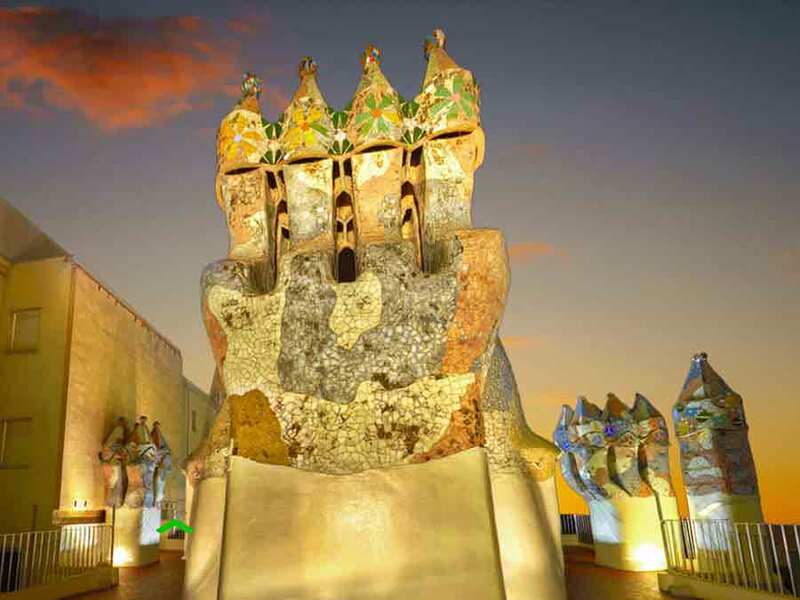 Gaudí adjusted the crown of the building to fetch the different heights of the neighboring buildings. 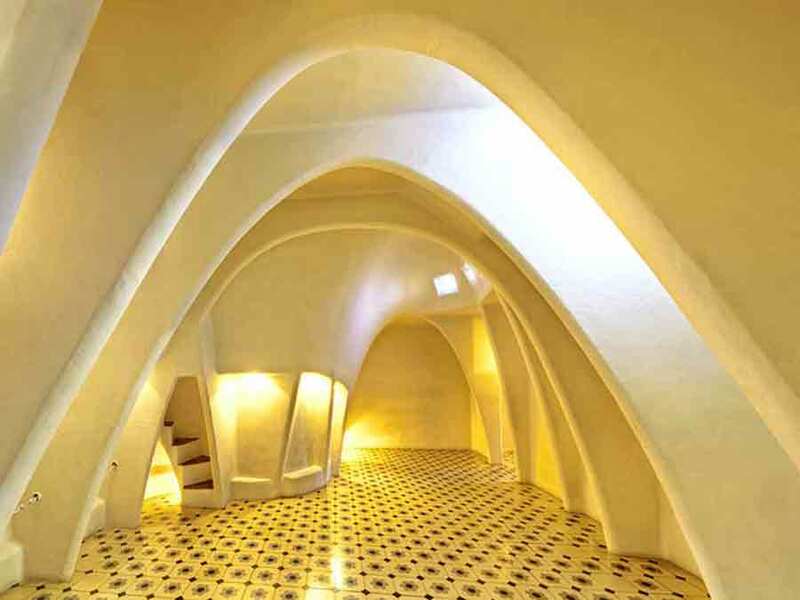 Project architect for the building made some plans, but its formula conception materialized with a plaster model that was created with his own hands to get the sinuous facade, a means to explain his vision much more practical.